I was attracted to this book because the cover is so colorful and fun but I really think it is something that my nieces and nephews are going to love. 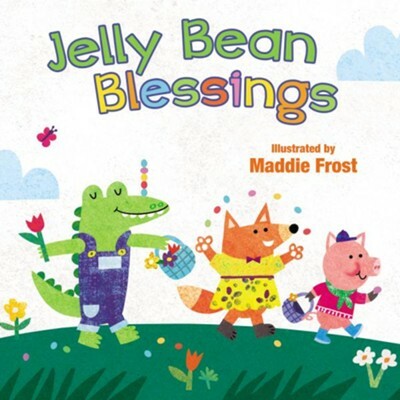 I was happy to have the chance to read and review Jelly Bean Blessings so that I can add it to the Easter basket of one of my nieces or nephews. It is not only the cover of this book that is colorful, the pictures all throughout the book are really bold and fun. I can't stop looking at the cover of this book. I like the way that this book reads, how each page has three words that are repeated, like "yum, yum, yum". My littlest nieces and nephews love books like that. I like how the book talks about all of the different things that make spring special. I didn't find anything in this book that I didn't like. I give Jelly Bean Blessings 5 out of 5 stars.